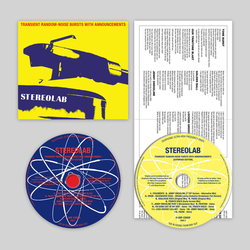 Stereolab - Transient Random-Noise Bursts With Announcements (Expanded Edition). Vinyl LP, CD. Bleep. Instant download of track: 'French Disco [Early Version Mix]' with all pre-orders. 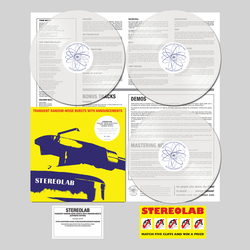 Originally released in 1993, and reissued here via Warp Records and the group's Duophonic Ultra High Frequency Disks, Stereolab's Transient Random-Noise Bursts With Announcements is finally made available again. Re-mastered from the original 1/2 tapes by Bo Kondren at Calyx Mastering and overseen by Tim Gane. The album arrives fully expanded with an extra disk of bonus material including alternate takes, 4 track demos and unreleased mixes. 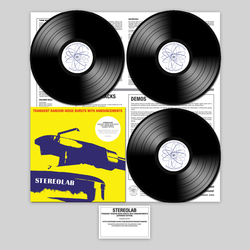 Transient Random-Noise Bursts With Announcements stands as one of the group's most loved recordings, and for newcomers, it's a great bridge into the motorik soundworld of Stereolab.